Shortly before Fall Break, students wrapped up their reading of Night, a Holocaust memoir written by Elie Wiesel. We added this book to the English 10 curriculum this year as a central part of a unit on social justice. so richly, brightly, dazzling yellow. Butterflies don’t live here in the ghetto. In addition to seeing Wiesel’s firsthand account of his time in the Nazi death camp known as Auschwitz, sophomores also were able to take a small peek into the lives of other children that lived during the Holocaust. Compiled in the book I Never Saw Another Butterfly are poems and drawings created by children who lived at Terezin (a transit camp) and who were eventually deported to Auschwitz. During the week of Thanksgiving Break, students were each given one poem from the compilation. They read and analyzed their poem, looking for any hints and details of the child who penned it. Students then chose a butterfly silhouette and decorated it, choosing colors and designs that they felt best represented the child and the experience described in the poem. 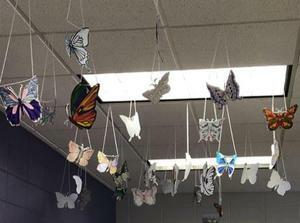 Thus, our classes began the first steps of a national Holocaust remembrance project known as The Butterfly Project. We hung the butterflies students had created in remembrance of the children of Terezin from the ceilings of our classrooms, where they remained throughout the rest of the unit. On the last day of the unit, we provided students with the recorded fates of the children they had briefly met through poetry. If the child survived the Holocaust, the butterfly remained in its place; however, if the child perished, students cut the butterfly down from the ceiling. Some poems had anonymous authors, but because of the low number of children that were recorded as surviving, we did not assume that many of the unknown authors were liberated. And then we were left with after we finished reading the fates of the surviving butterflies/children. As Pavel Friedmann stated in his poem, many butterflies could not survive the brutalities of the ghettos and camps. A key reason we chose this project and Night was to show students the importance of remembering the past so that the mistakes of history are not repeated in the future. As Elie Wiesel stated, “For the dead and the living, we must bear witness.” After wrapping up our study of Night and the Holocaust, students researched recent genocides in order to understand both why the Holocaust is so important to study and remember and how we can apply the lessons from that period to the world we live in today. Though this is a unit in which the materials we read and study convey much despair, sorrow, and grief, we also wish that it is one that ends with a hope for a better tomorrow.